The sublime new(er) champagne shop in Épernay “520 Champagnes et Vins d’Auteurs” hosts Saturday morning champagne tastings. Most of the champagnes Pierre-Yves Cainjo carries are by independent winemakers, though he does have the Krugs, Crystals, Veuve-Clicquots. 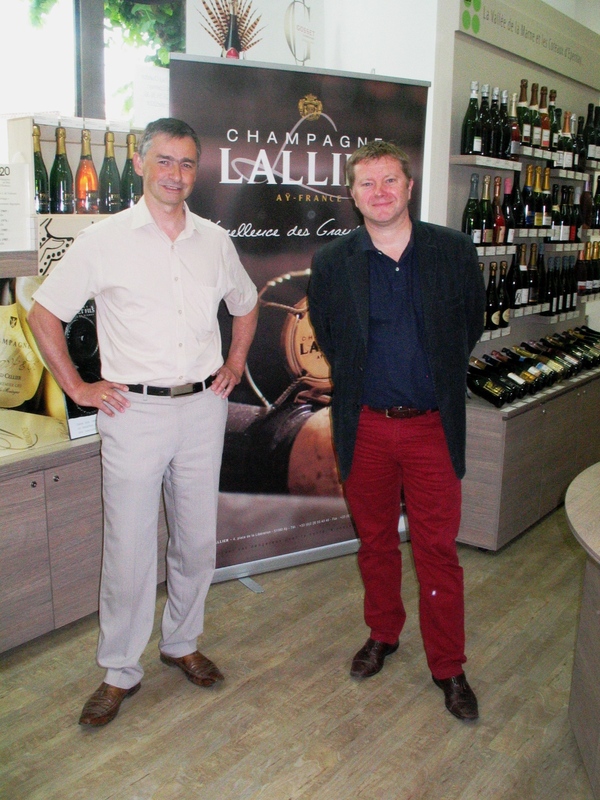 Shop owner Mr. Cainjo was France’s first official Ambassador of Champagne, as designated by the CIVC, in 2005. 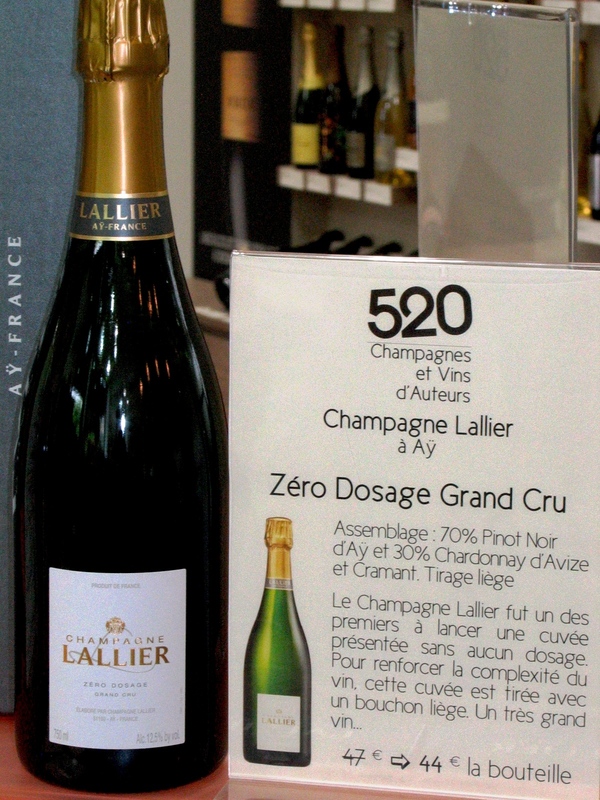 The name of the shop, located just across from the architecturally distinctive and famous Moon House, is reference to the 520 different types of champagnes, and some specialized wines such as Ratafia or Rosé des Riceys, that he has on stock. 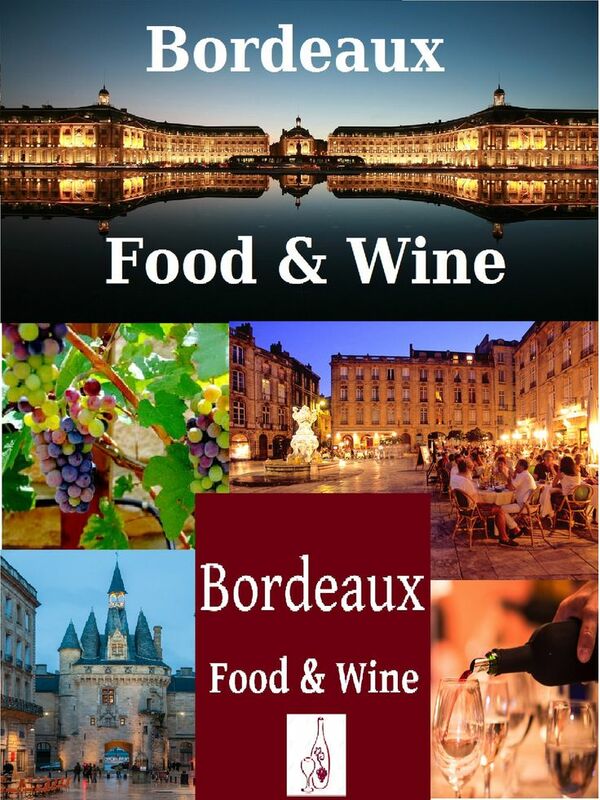 A rare chance to meet the winemakers and winery owner-operators is what you will find at these tastings, in addition to exquisite champagnes being poured. And this being summer in the quaint and convivial town of Épernay, the pours tend to be a dash bit generous. Aÿ is known for its Pinot Noir, so the Chardonnay grown here derives such distinction from the terroir that the French have coined a term to describe it, “ça Pinote.” Accomplished sommeliers in blind tastings can easily pick out a Chardonnay from Aÿ. 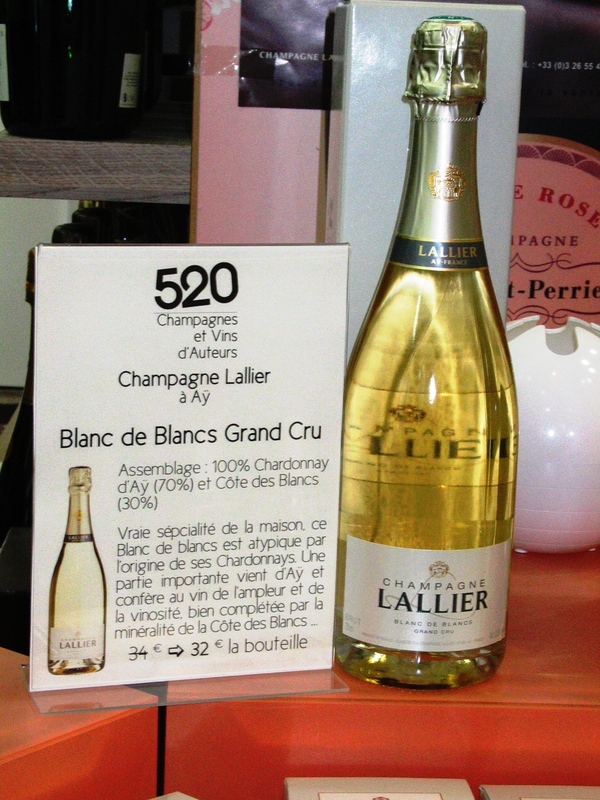 Champagne Lallier’s deep roots in the region date back centuries and once were owned by the same owner as Deutz. Francis Tribaut, since 2004, is now the managing director and winemaker, as well as proprietor. He makes his champagnes exclusively from Grand Crus and Premiers Crus terroirs. a. Grand Reserve Grand Cru €28.00 9 gr. 65% Pinot Noir, 35% Chardonnay. Chardonnay from Avize and Cramant. 100% Chardonnay. 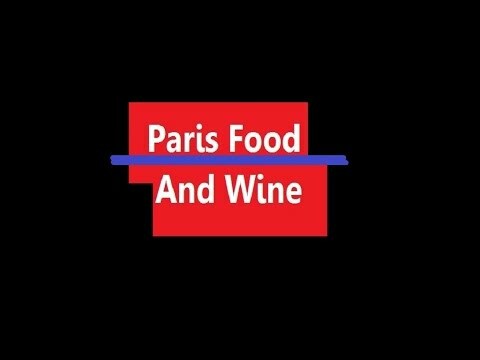 70% Aÿ, 30% Cote des Blancs. Aperitif or Dessert. Chardonnay, Pinot Noir, Chardonnay maceration. Summer rosé. 70% Pinot Noir Aÿ, 30% Chardonnay from Avize and Cramant. Tip from Tribaut: Not all wines merit zero dosage. So it’s essential to determine first if the wine is elegant enough to skip the liqueur adding process. This one does. It has rested 4 years in the cellar. Best paired with seafood as the ever so slightly salty-mineral taste excellently sets off the fish or shellfish. A classic grower and head of the family, M. Loriot’s grandfather planted some of their now 70 yr. old vines. You won’t find very often a 100% Pinot Meunier champagne. At Champagne Michel Loriot, the predominant vines are Pinot Meunier, hence this rarity is something of a signature for the house. That and their very old vines. Michel Loriot Champagnes is one of only two independent wineries in France that have been certified with the new « Haute Valeur Environnementale » (as of April ’12). This designation is intended to have as much of an impact on the market as the similar Bio/AB certification. 100% Pinot Meunier. The only one of their production that they add a vintage year to and then only when the harvest has yielded exactly the right balance. These grapes are from a very small plot where the calciferous buildup from ancient shell residue lends itself to the vines having to dig very deep for their water supply. Only 4,000 bottles for the 2006 vintage. Excellent Pairing: Very old Parmesan, with crystallized nuances. Also, try this champagne decanted in a carafe. It blossoms. Pair with shellfish, oysters, Asian dishes. Sushi. c. Brut Reserve €24.00 10 gr. 80% Pinot Meunier, 5% Pinot Noir, 15% Chardonnay. 50% 2009 vines, 25% 2007, 25% 2008 vines. This Pinot Meunier is different from the other meuniers, it’s always harvested at the height of its acidity. Ages 18-20 months. Disgorgement 2012. Classic aperitif, cocktail, marriage. Today it is Charles who is in charge of the degorgement and the corking. For example, their Extra Brut Ligne 79 1999 vintage is one he disgorged only in 2009. For their Extra-Bruts, which often in Champagne-speak can mean a non-dosage wine, in this case has varied meanings and represents anything from zero dosage to 2-3 grams of sugar added. Each vintage has about 500-1000 bottles produced. They are a certified organic winery.